Brought to you by Revenue Performance, in collaboration with mThink. The Online Advertising Blue Book guide to ad networks and exchanges is laid out in two main sections: one focused on the needs of agencies and advertisers, and the second focused on those of publishers and affiliates. With over 400 advertising networks now competing for business, Revenue Performance’s new Online Advertising Blue Book has been designed to give networks a way to stand out from the crowd and differentiate themselves, while providing agencies, advertisers and publishers the information they need when selecting an ad network partner. Revenue Performance’s Online Advertising Blue Book gives ad networks the opportunity to cut through the noise. 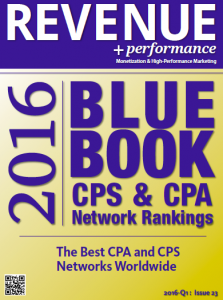 The Online Advertising Blue Book is published by mThink, LLC. mThink publishes consumer magazines and contract publishing solutions. It also develops existing resources to provide clients with focused custom publishing solutions. Partner with the voice of the Industry. Media Kit with rates available on request.